Posted on July 29, 2016 at 9:50 pm. Here at CDA Adventures we have your covered for you SUP Board Rental CDA. We deliver to the north shore where the Spokane River meets the lake. This allows you to enjoy the beach along North Idaho College or paddle your way to Tubbs Hill for a hideway spot to enjoy lunch! The Spokane River is not as wavy and so if you want to paddle some distance, going up river is an option and super fun! 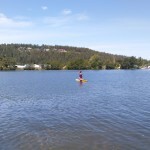 One of the greatest things about getting an SUP board on Lake CDA is that everyone loves them. Even little kids. You can get exercise, sunbathe, entertain your kids, and get out there on the water for way less than renting a boat or a jet ski……and it is just as fun exploring. We’ve fished and traveled distances on them. Get your SUP Board Rental CDA!